Formed in 2006 from the merger between Zschokke and Batigroup, Implenia can look back on around 150 years of history in the construction industry. Experience, know-how, size and financial strength allow the company to offer its services throughout Switzerland and – in selected disciplines – international markets. The international business was further strengthened by the acquisition of Bilfinger Construction GmbH at the end of 2014. In the Development Segment, Implenia deploys its project development expertise to take real estate projects from initial idea to completed building. 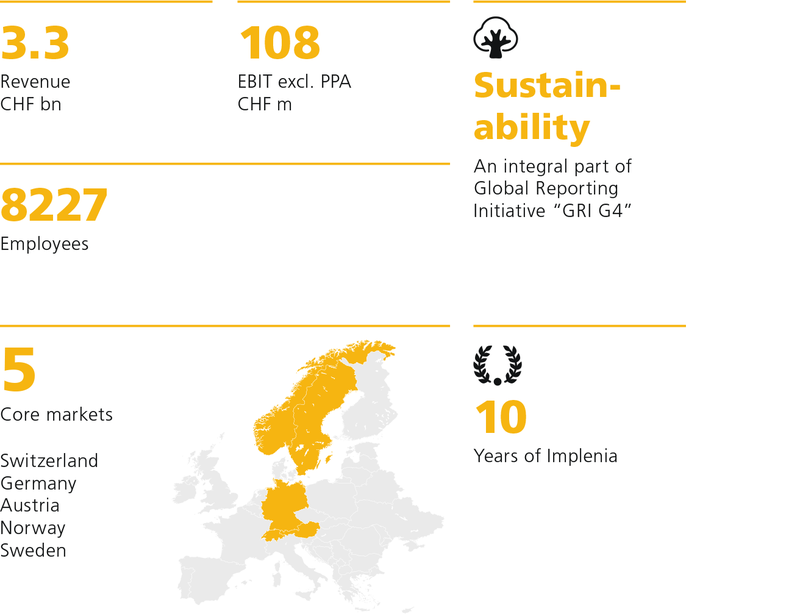 In the Switzerland Segment, Implenia operates through its Modernisation, Buildings and Swiss regional units. The Modernisation unit brings together the Group’s capabilities in conversion and renovation, from consultancy to implementation. The Buildings unit offers its supra-regional customers in Switzerland integrated services for complex buildings, ranging from planning and coordination to actual construction. 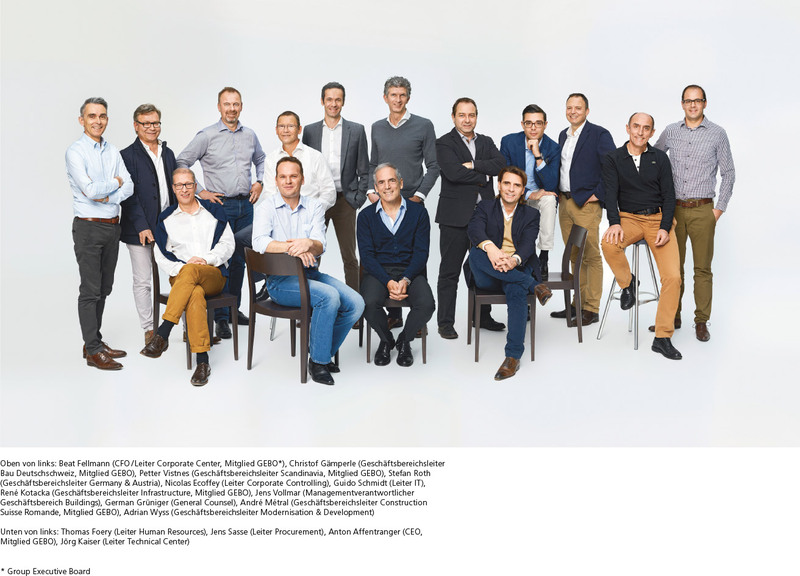 Construction German-speaking Switzerland and Construction French-speaking Switzerland are the face of Implenia for local customers in Switzerland looking for roadbuilding, civil engineering, infrastructure maintenance and regional building construction capabilities. The Infrastructure Segment focuses on tunnel construction and foundation engineering in all Implenia’s national markets. It brings together the company’s expertise in tunnelling, foundation engineering, large-scale projects and design / planning. The International Segment includes Implenia’s activities in its target markets of Germany and Austria, Norway and Sweden. Implenia Scandinavia offers its customers comprehensive services for complex infrastructure projects including conventional tunnelling. Implenia Germany & Austria is the expert provider for regional customers in German-speaking countries outside Switzerland that need services for civil works, general civil engineering, maintenance and repair, and building construction. Implenia is Switzerland’s market leader in the buildings and civil engineering sectors. Implenia’s head office is in Dietlikon near Zurich, and it has approximately 100 branches throughout Switzerland, as well as representative offices in Germany, Bahrain, Ivory Coast, Mali, Norway, Austria and Sweden. As at end-2015, the Group had 8,227 employees and an annual turnover of CHF 3.3 billion. Implenia is listed on the SIX Swiss Exchange (IMPN, CH0023868554). Implenia has a clear vision that encapsulates our long-term goals. We are guided on our journey to these goals by certain clearly defined values. These determine our corporate culture and influence the way we think and act. In everything we do. We develop and build the Switzerland of tomorrow. We are helping to shape Europe’s infrastructure. We want to be the partner of choice for customers and employees. 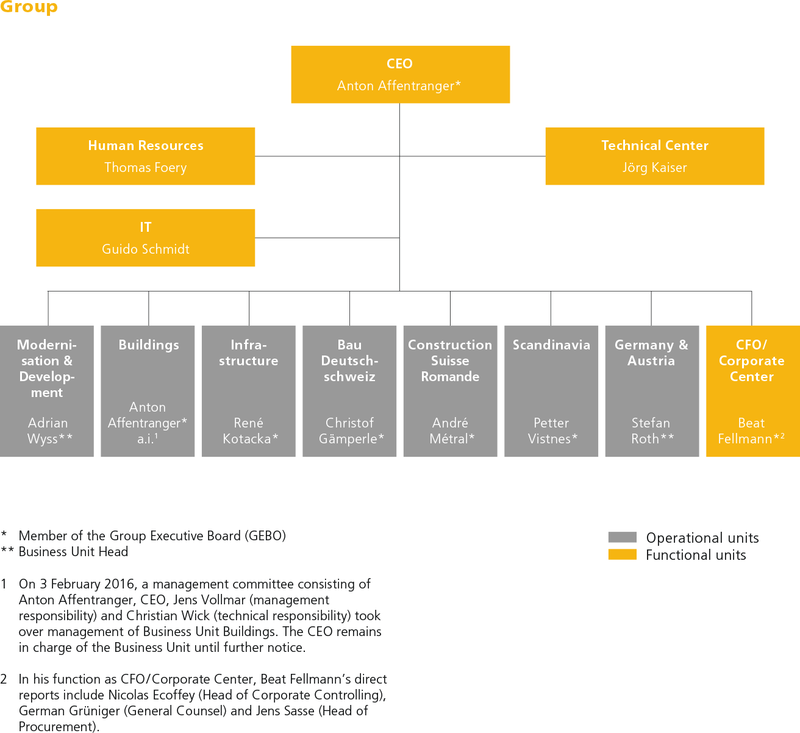 Implenia’s organisational structure is based on operational and functional units. The operational units focus on their core areas of expertise, but work hand in hand with each other. They are assisted by the Technical Center, IT, Human Resources and the centralised group functions provided by the Corporate Center. The Corporate Center provides central services to support the operational areas. These services include Corporate Controlling, Business Development, Investor Relations, Legal, Marketing / Communications, Investment Management, Treasury, Insurance and Procurement. The Technical Center brings together the overarching topics of Sustainability, Health & Safety, Technical Risk Management, Operational Excellence and BIM. 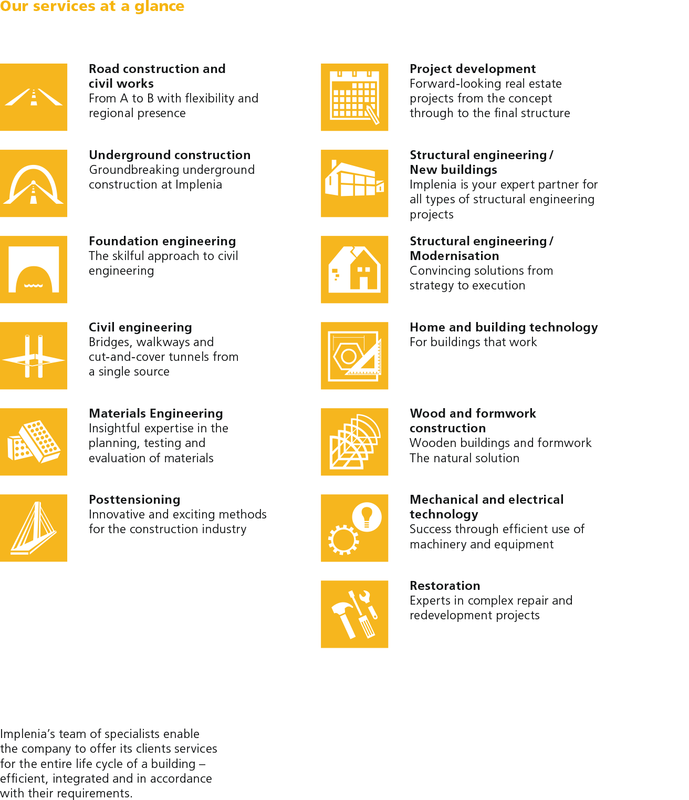 It also includes two technical areas: Machinery & Electrical and Building Materials & Formwork Technology. The Sustainability Department within the Technical Center has one team based in German-speaking Switzerland and one in the French-speaking part of the country. It functions as a competence centre, looks after the implementation of sustainability initiatives and communicates information internally. The department’s core tasks include securing certificates and labels for major projects, implementing environmental protection measures on construction sites, working in steering groups to develop sustainability standards (e.g. its work on the SIA energy efficiency path and on the “Sustainable Construction Switzerland” standard), recording the company’s energy and resource flows, setting the strategic direction for sustainability, and internal and external communication. The department is supported and supervised by the Sustainability Committee, which consists of the CEO, the Head of the Technical Center, the Head of Engineering, the Head of Communications Group and the Heads of Sustainability in German-speaking and French-speaking Switzerland. Sustainability topics are regularly put on the agenda of Group Executive Board meetings. 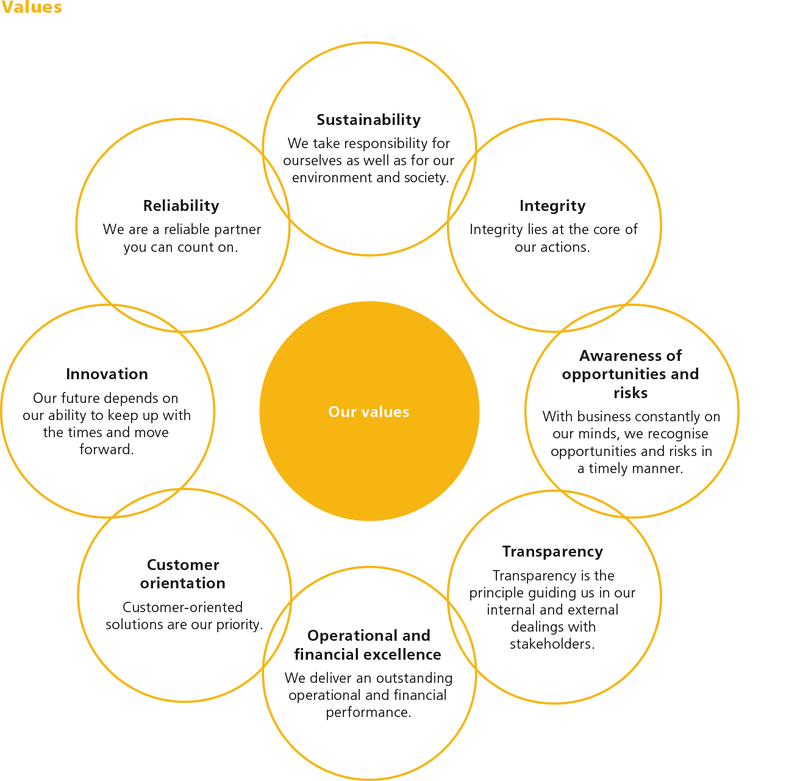 The Group’s integrated business model ensures that sustainability themes play an integral role at the individual Business Units and in all their services. The seven HSEQ (Health, Safety, Environment, Quality) Officers in the operational Business Units and their Safety Officers work closely with the Sustainability Department in the Technical Center. There are about 1.7 million residential buildings in Switzerland, as well as 71,500 kilometres of roads and 5,100 kilometres of rail track. Building and operating all this housing and transport infrastructure accounts for 40 percent of Switzerland’s energy consumption and 30 percent of its greenhouse gas emissions. 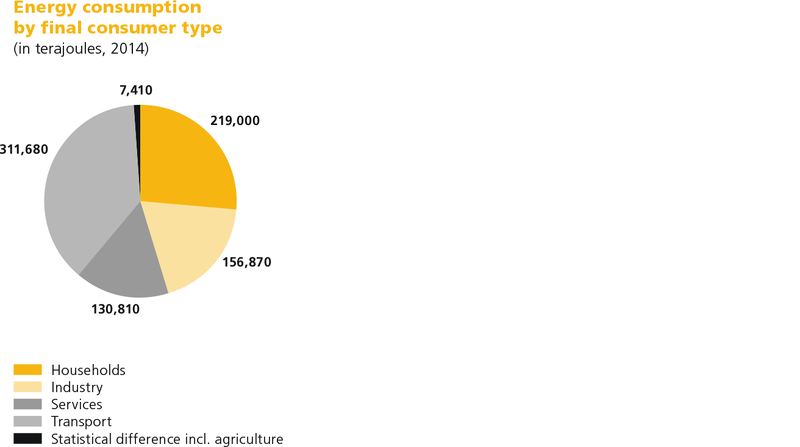 The 322,000 people who work on and around Swiss construction sites generate over CHF 62 billion in turnover every year. These figures illustrate just what an enormous influence the construction industry has on the economy, the environment and society. Implenia obviously wants to apply its concept of sustainability to its products and services (i.e. its core business), and in doing so help shape Switzerland’s future. Sustainable products and services are the answer to many social concerns, they help conserve natural resources and also create long-term financial value. Depending on where its products or services sit within the value chain, Implenia can influence the overall sustainably of a project to different degrees. At the planning stage of a project, for example, fundamental decisions can still be taken about using “greener” materials and reducing operational energy consumption; but if Implenia only comes in at the construction stage the main focus will be on environmentally friendly working practices. Implenia also uses its leading position in the Swiss construction sector to encourage broader acceptance of sustainable approaches, e.g. by running pilot projects, collaborating on standards or signing business partners up to its values. The consequences of climate change, and measures to mitigate them, are of central importance to Implenia. 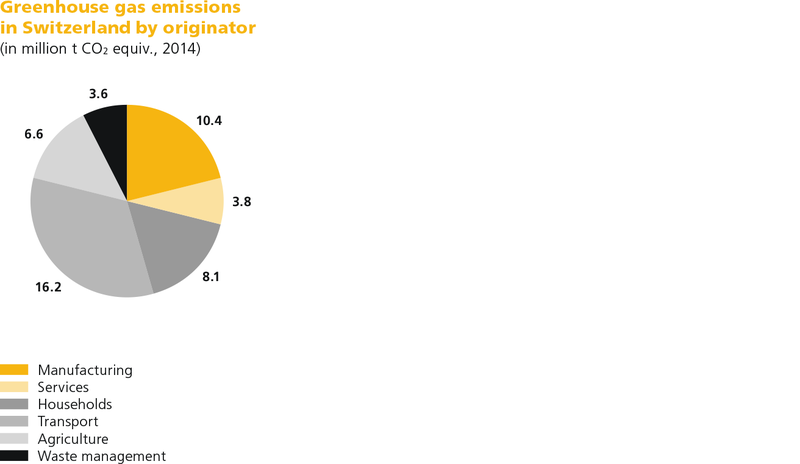 As a construction company it has the ability to help reduce greenhouse gas emissions by adjusting its own activities. By choosing building techniques for its own projects that require less grey energy, Implenia can contribute to the reduction of emissions during and after construction. Implenia also minimises the direct consumption of fossil fuels on building sites, and in workshops and production facilitie (see chapter 4).